Located at New York Avenue and Eighteenth Street, Superior’s Billings Park sits next to the St. Louis River and used to include a swimming beach and boathouse; the waters surrounding it were once the site of various water sports, including sailboat races. Remnants of granite bleachers used by crowds to watch the various competitions on the river can still be found along the riverbank. The neighborhood that surrounds the park now shares its name, but it hasn’t always been called Billings Park. In 1889 James Roosevelt’s West Superior Iron & Steel opened along the shores of St. Louis Bay north of Belknap Street. In 1892 the plant turned ore from the Vermilion Range into steel plates used to build Captain McDougall’s whalebacks. The area surrounding the plant was first known simply as the Steel Plant; later it became the Ninth Ward and was referred to as the City of Churches after nine denominations built twelve churches for the plant’s employees and their families. But the Panic of 1893 closed the plant. Fortunately, capitalist Frederick Billings owned a great deal of land along the river, much of it considered the most beautiful in the region. He donated a large portion of it for the formation of Billings Drive, which follows the shore to the upper Pokegama River (he also donated the land for Gitchinadji, Superior’s first golf course). Later, his heirs donated more land. The city renamed the neighborhood Billings Park, and it included forty acres on a point jutting into the river; there the city established a park. In 1907 Billings’ heirs expanded the park by donating another eighteen acres; newspapers reported that they refused to take money for the land. Superior’s Billings Park is just about the best place for a family picnic in all of the Twin Ports. Its man-made facilities include pavilions, grills, picnic tables, restrooms (including a facility for disabled people) as well as horseshoe pits, swings, a small backstop for softball, and plenty of lawn for volleyball, bocce ball, or croquet. The park sits next to the St. Louis River (it includes boat access), and trails provide hiking access (along a gentle, gravel-lined trail) to the shore—and to the great view of Spirit Mountain across the river (perfect for fall colors). The trail and park are home to a variety of plant life, including lily pads, rushes, cattails, raspberries, and blackeyed susans. Near the picnic facilities, the park is neatly groomed and blooms with a variety of trees, shrubs, and flowers. 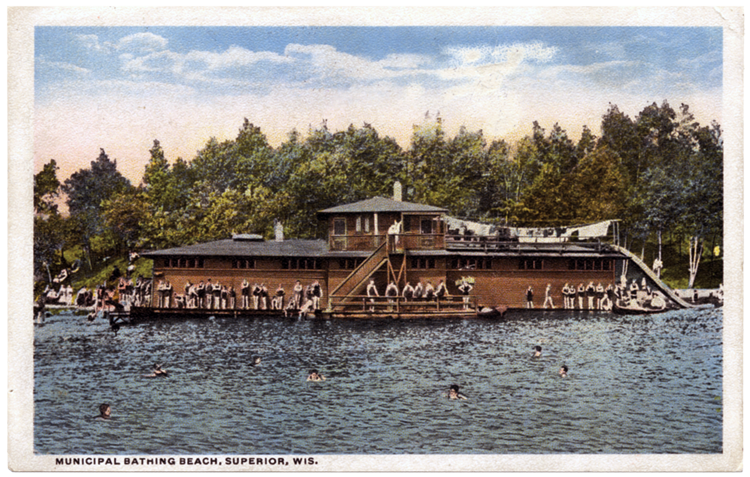 Billings Park once included a swimming beach and boat house and the waters surrounding it were once the site of various water sports, including sailboat races. You can still sit on the remnants of granite bleachers once used by crowds to watch the various competitions on the river. Unfortunately, while the St. Louis River has become cleaner over the last few years, the river is currently too polluted for the city to allow swimming at the park. The park is located at New York Avenue and 18th Street. Take Belknap Street west until the road veers left, then follow the signs to the park. South from the park you can drive through the Superior Municipal Forest to Pokegema Park.